Our product range includes H SCAN for hydrogen detection. The presence of Hydrogen in molten Aluminium poses problems to the foundry and casting industries, as high residual hydrogen can result in significant porosity after casting, leading to rejections or the risk of mechanical failure. H-Scan makes it easier to substantially improve both the Quality and the Reliability of Aluminium castings,by enabling precise control of Hydrogen content in the Aluminium melt just before casting. No under or overde- gassing. No rejections, no wastage of time or money.Metal Power's H-Scan Analyser has been built to rapidly and accurately analyse the Hydrogen content in molten Aluminium and has a number of unique features. H-Scan uses the reduced pressure technique to measure the Hydrogen content. 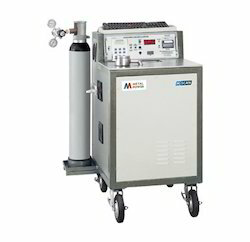 By controlled solidification, the partial pressure of all the Hydrogen released is accurately measured and related to its percentage. H-Scan gives accurate quantitative information within 3 to 5 minutes of sampling, enabling users to optimize the level of de-gassing.H-Scan comes with the assurance of high-quality, reliability and the highest levels of service from Metal Power. • Electrical Input : 230V (+/-10%) 50Hz Single Phase with 5 meter armored power cable. • Sample Weight : 100gm nominal.